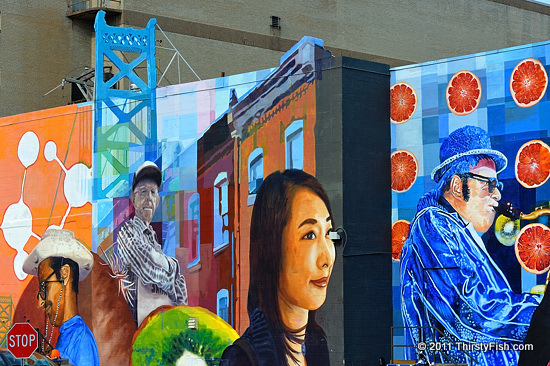 With 3,553 murals scattered throughout the city, Philadelphia is internationally known as "The City of Murals". If you visit Center City, make sure you walk the "Mural Mile". If you do not have plans to visit Philadelphia, look out for the photos of the 17 murals on the "Mural Mile" in future posts. The Stop Sign that you see in the lower left corner of the photograph gives the viewer a sense of the size of the mural. When photographers intend to communicate a sense of scale, they embed familiar forms (objects) in their photographs. Compare this mural with one from a prior post.